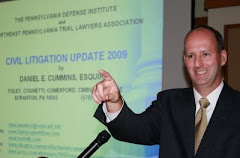 On December 29, 2009, Judge David W. Lupas of the Luzerne County Court of Common Pleas issued an Order in the post-Koken case of Doran v. Williams, Price, and Nationwide, No. 7792-CV-2009 (Luz. Co. Dec. 29, 2009) denying preliminary objections by the tortfeasor defendants as well as by Nationwide as the UIM carrier, both of which sets of preliminary objections had argued in part for the severance of the third party liability claims from the underinsured motorists (UIM) claims. As such, all claims were allowed to proceed in a consolidated fashion. This Luzerne County decision is consistent with the prior Luzerne County Order without opinion by Judge Burke in the case of Glushefski v. Sadowski and Erie Ins. Exchange, 1189-Civil-2009 (Luz. Co. July 24, 2009)(Burke, J. )(Preliminary objection by tortfeasor defendant seeking to sever third party claim from consolidated UIM claim overruled; case allowed to proceed in a consolidated fashion). I have a copy of the both of these Luzerne County decisions if anyone needs them. I note, however, that each are only simple Orders denying the preliminary objections without any rationale or supporting Opinion. Thanks to Attorney Robert Goodman of the Scranton office of the law firm of Forry Ullman for bringing the Doran case to my attention.